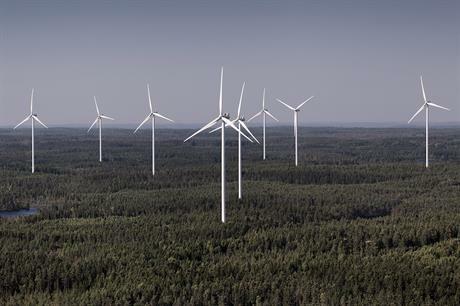 SWEDEN: The country's 2030 renewable energy targets will likely be met in 2021 following an expected surge in wind power installations, trade body Swedish Wind Energy Association (SWEA) has predicted. However, if Sweden does not change subsidy rules surrounding investments in clean energy projects, profitability of new projects will be "ravaged", the SWEA believes. Last year, Sweden set a new renewable energy target of 46.4TWh/year by 2030, rising from 28.4TWh/year by 2020. The country had 6,691MW of wind power installed by the end of 2017, accounting for an estimated 17.2TWh of annual energy production, according to SWEA figures. Including output from other clean energy sources, such as solar PV and hydropower, however, Sweden is currently within 4TWh of its 2030 target, the industry organisation has claimed. Sweden is expected to add an extra 815.5MW of wind power capacity by the end of 2018, the SWEA forecast, with total output from wind power rising to an estimated 19.8TWH/year. In a joint statement with Gustav Melin, CEO of clean energy organisation Svebio, Charlotte Unger Larson, SWEA CEO, wrote: "The rapid expansion means that the 2030 target will be reached by 2021 – nine years in advance." However, the pair warned that the current design of Sweden’s system of electrical certificates, shared with neighbouring Norway, would affect the financial viability of existing power producers. The rapid expansion of Sweden’s renewable energy capacity is outpacing subsidies provided under the current certificate system, threatening their profitability, Melin and Larson wrote. They warned the effect on investments made in the last 15 years could be "devastating" and that consumers could be left to foot the bill. Accordingly, prices in the renewable certificate market are forecast to be nearly 70% lower for 2021 than 2020 because of the newly installed capacity. "It is important to show political confidence that (Sweden) safeguards investor confidence. This is best done by promptly introducing a volume-based stop rule so that the system can be closed in balance," Melin and Larson added. The Swedish Energy Agency is due to present proposals for re-designing a stop rule in December 2018.